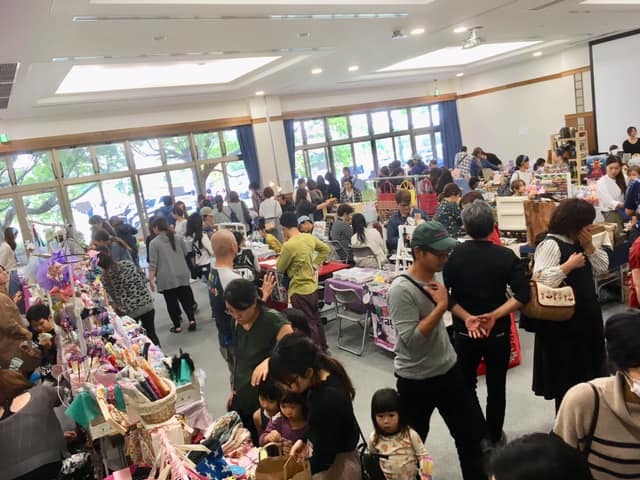 Like their counterparts in the U.S., Mammy’s Markets on Okinawa are frequently organized weekend events that take place at different locations throughout the island and feature sales of goods and products hand-made by participating sellers. Flea market items are often included and usually some of the proceeds are donated to various charities. 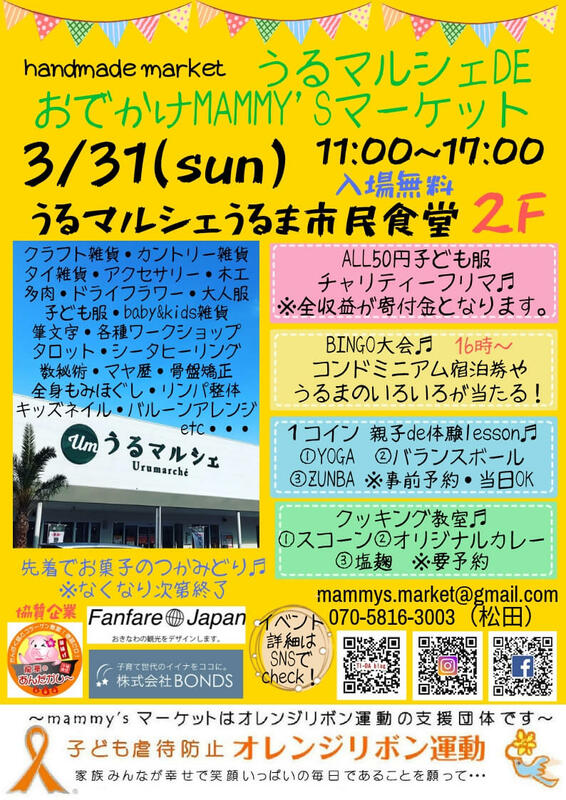 The next Mammy’s Market takes place this Sunday, March 31st, at the 2nd floor restaurant of the Urumarche Mall in Uruma City. This event is a charity event focusing on Orange Ribbon campaign for the child abuse prevention. One of the main events on Sunday is a charity flea market where children’s clothes are on sale, all for ¥50 each. 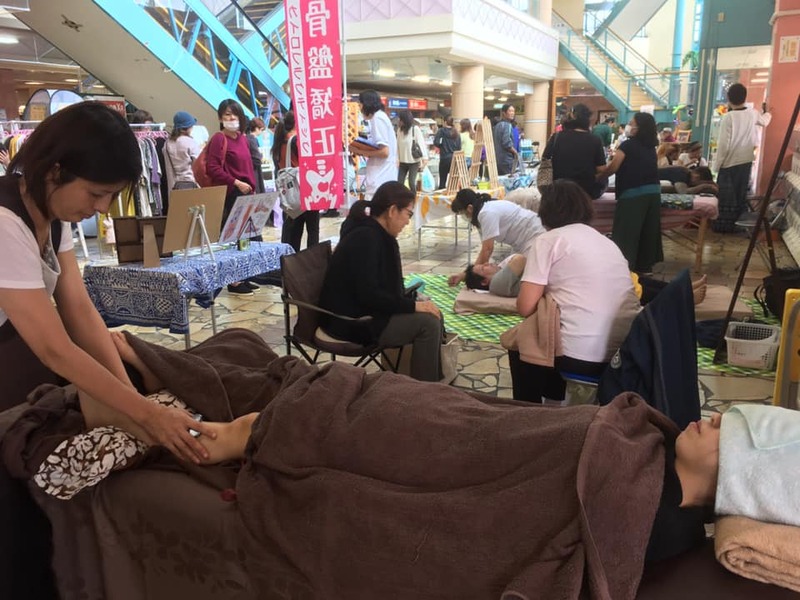 All earnings from the flea market will be donated to organizations supporting children’s welfare and foster homes in Okinawa. Over 30 shops specializing in handmade crafts will be there. Mammy’s Market welcomes donations of children’s clothes, shoes, bags, toys and picture books. Donations are accepted at the venue on the day of the event. Only items that are not stained, dirty or torn are accepted. In addition to the flea market, many other programs are scheduled to take place at the Mommy’s Market during the day. Over 30 shops specializing in handmade crafts will be there, featuring country crafts, Asian crafts, accessories, dried flowers, soap flowers, clothes, figurines and more. There are eight hands-on workshops including soap, original bag, herbarium, and candle making. Visitors can also try their hand in calligraphy. Scalp, Thai, aroma, and lymphatic massages, plus pelvis correction and more are also on the menu. Scalp, Thai, aroma, and lymphatic massages, plus pelvis correction and more are also on the menu. And not to forget the theme of the day, there are children’s nail and health checking programs. Who would not be interested in the future? Fortune telling, including tarot cards, numerology, pastel art and others, all have their own booths. For the price of the crafts, workshops and fortune telling, visitors should check with each vendor at the venue. Other events include one-coin (¥500) family-friendly lessons in Yoga from 11 to 11:50 a.m., for 10 participants, first come first served. A Yoga lesson for persons over 15 years old is held from 2 ~ 2:50 p.m. with participation limited to 20. A family-friendly balance ball lesson is held from 1 to 1:50 p.m. for 10 participants. A family-friendly ZUMBA® class is from 3 to 3:50 p.m. with space for 30 persons. Those under 18 can participate for free. Advance reservations are required for the lessons above. Reservations can be made at the booths. Bingo games will start from 4 p.m. Bingo cards are available at the venue for ¥100 per card. All earnings from the Bingo cards will be donated to organizations supporting children and foster homes in Okinawa. Winners of the Bingo games will receive prizes such as hotel vouchers for a condominium hotel on Hamahiga Island, meal coupons for ramen, taco rice, and Okinawa soba, rice 3kg bag, sweets, fresh vegetables and more! As a participation prize, everyone gets a 5% off shopping coupon valid at shops in Urumarche Mall. “Mammy’s Market is a really good event for families. We are confident everyone will enjoy and be happy at this event,” a representative of organizers of the event said. Time: 11:00 a.m. ~ 5:00 p.m.
Venue: Urumarche Mall 2nd floor restaurant.